Questions, questions, questions. I'm sure you have some. Here are some (with answers) that you may find useful. If you still need an answer on something JPS Lotus related, then email me. Q: Why John Player Special Team Lotus? A: In the late 1970s I got my first (and only) Scalextric set. The two cars that came with it were the 6-wheeled March 771 and a Lotus 77, my favourite (which I still own). For almost 20 years I thought it was a Lotus 79 (in which Mario Andretti won the 1978 F1 World Championship), but when I did my research I found out otherwise. The JPS livery is easily one of the best ever in F1, and the Lotus 79 one of the most beautiful cars (but I do think the Williams FW07 is better still!). So when I think JPS Lotus, I think Lotus 79. But when many other people think JPS Lotus, they think Lotus 72. Either way both sets of fans find their way here! Q: Why do you concentrate on 1970-1987 when Team Lotus existed from 1948 to 1994? A: Well this site is called jpslotus.org... Team Lotus cars displayed the JPS livery from 1972-1978 and 1982-1986. I've started the website timeline in 1970 as that is when the Lotus 72 first appeared (albeit in Gold Leaf livery). I finished the timeline in 1987, which is the last real great year for Team Lotus as Ayrton Senna won in a Lotus 99T (in Camel livery). Q: Where are all the photographs of the Lotus 92(T), 93T and 94T? A: The simple answer is that the cars don't exist any more, and so it's impossible to take photographs of them! The type 92(T), 93T and 94T are all evolutions based on the chassis/tub of the Lotus 91. In some cases the cars existed for less than a season, and were then 'upgraded' to become a later type model. In recent years these chassis/tubs have been restored to Lotus 91 specification, which then go on to race in the FIA Historic Formula One Championship. Classic Team Lotus run two type 91s, which makes it easier to get photographs. Q: Where can I get a model of a Lotus (usually a Lotus 79)? A: You may want to visit my models site, which lists various shops and resources for buying/finding model cars. 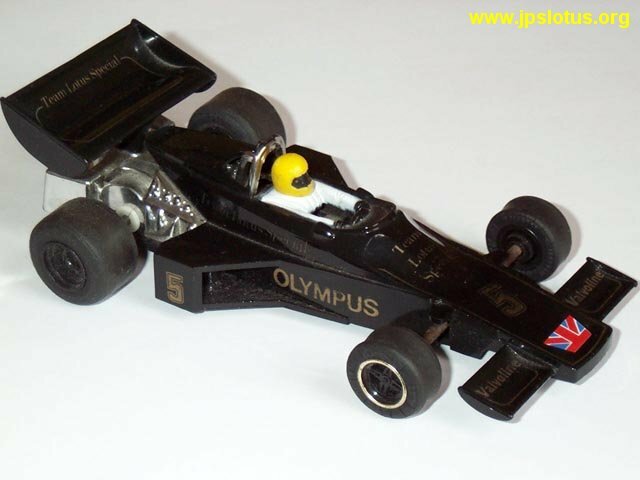 Minichamps have made a 1/43 Lotus 79 (in non-tobacco JPS livery circa 1978), which is now getting hard to find. You may want to have a look on eBay. Minichamps have finally decided to make a 1/18 Lotus 79! The car will be in 1978 non-tobacco JPS livery. The model number for the Mario Andretti car is 100780005 and the Ronnie Peterson is 100780006. I expect 3rd party tobacco conversion kits to follow on soon after... You can get (tobacco liveried) 1/43 and 1/18 Lotus 79s in kit or handbuilt form, but for the former you need a fair bit of expertese, and a large amount of money for the latter (upwards of �250 for a 1/18!). Q: You're using my pictures! A: Admittedly I have got a fair few pictures that I've found on the web. I'm more than happy to attach a copyright notice to or remove any pictures upon request.